This year the airlines are expecting to have over 25 million passengers over the Thanksgiving holiday 12 day period which is a 1.5% increase over last year. At about 2.1 million passengers per day during the 12-day holiday period, there will be about 31,ooo more passengers per day, according to the airlines. The busiest days will be Sunday, Dec 1, followed by Wednesday, Nov. 27 and Monday, Dec 2. The lightest days will be Thursday, Nov. 28 and Friday, Nov. 29. Throughout the holiday period planes will be more than 85% full. John Heimlich, chief economist for the group, Airlines for America, said air travel costs less after inflation than in 2000 and travel continues to rebound from the economic downturn. 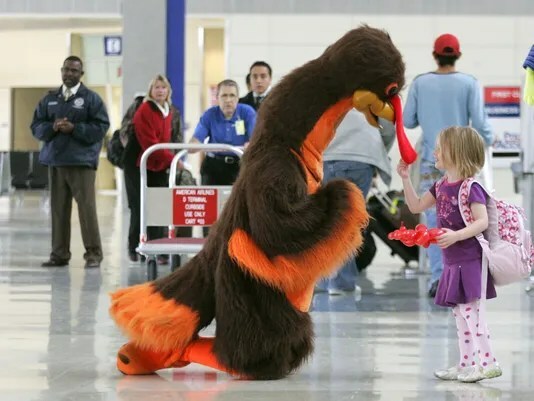 “More seats are returning to the marketplace to accommodate growing demand as carriers are increasing the number of available seats for Thanksgiving travel by roughly 2%,” Heimlich said. The holiday projections came one day after the Transportation Department reported that the average domestic airline fare fell to $378 during the second three months of the year, down from $392 from the previous year. The fares didn’t include fees, such as baggage. The highest average fare was at Huntsville, Ala. at $547, and the lowest was $159 at Atlantic City, N.J., according to the Bureau of Transportation Statistics. Average fares are down 18.4% from 1999, when adjusted for inflation, according to the bureau. Despite fares declining against inflation, Heimlich said the 10 largest U.S. airlines reported combined earnings so far this year of $4.5 billion, a 4% net profit which is up from $312 million during all of last year. Airline investment more than doubled since 2010, to $965 million per month this year, to buy new planes, install WiFi and improve websites, Heimlich said. “When airlines are profitable, customers, employees and the economy win because airlines are better able to invest in the business and improve the product and travel experience,” Heimlich said.